Although each collaborative process is unique, the core components are the same. Considering each of these four components, we seek to make each function optimally. Each collaborative process necessarily involves a collaborative conversation. Although shown as a flow, in practice, we must revisit some elements multiple times for the best process. 1. Invitation: The invitation includes the steps and actions that bring the stakeholders together. It should be inviting and clearly state the process goal and how we will operate. 2. Conversation: Successful collaboration requires meaningful, direct, open and healthy conversations. At times, these conversations are multi-layered and complex. 3. 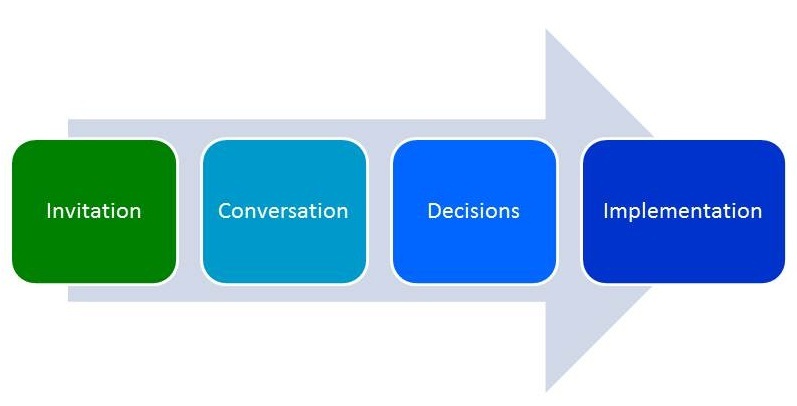 Decisions: If the process is shaped well, stakeholders have sufficient data and understanding to agree on what decisions are needed, what are the relevant criteria and how to choose from among options. 4. Implementation and adjustment: Without effective implementation, the process can be no more than a nice talk. We plan processes that are action oriented and result in change.